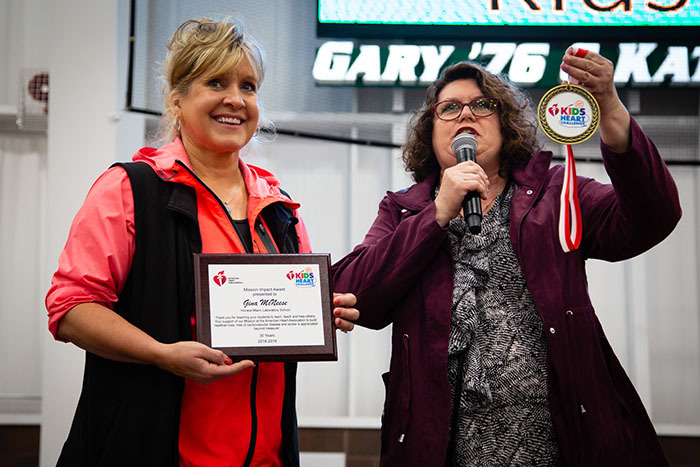 The American Heart Association on Friday recognized Gina McNeese, an instructor of health and physical education at Northwest Missouri State University and its Horace Mann Laboratory School, with its Mission Impact Award for her commitment to physical fitness instruction and 30 years of leading students through the organization’s Kids Heart Challenge. Stephanie Jumps, a youth market director with the American Heart Association, presented a medal and plaque to McNeese in front of a crowd of more than 400 third and fourth grade students and teachers from schools throughout Nodaway County. McNeese was leading them through fitness activities Friday morning during the Hy-Vee Kids Fit event at the Carl and Cheryl Hughes Fieldhouse on the Northwest campus. The American Heart Association’s Mission Impact Award recognizes volunteers who achieve milestones in their commitment to the organization’s cause. McNeese joined the Northwest faculty in 1994. 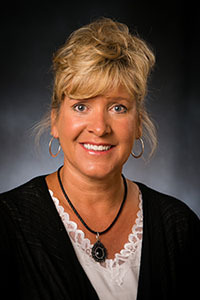 She received a Bachelor of Science degree in physical education and health as well as her Master of Science degree in physical education from Northwest. McNeese was recognized in 2016 by the Missouri Association for Health, Physical Education, Recreation and Dance (MOAHPERD) as the Northwest District Elementary Physical Education Teacher of the Year for 2016. Outside of her teaching, McNeese conducts CPR, first aid, lifeguard training and water safety workshops in Missouri and Iowa as well as Northwest. She also leads multiple church youth groups, summer youth programs and swimming lessons, and she volunteers for community improvement and clean-up projects. With the sponsorship of Hy-Vee in Maryville and Northwest as well as the involvement of a variety of local partners, Hy-Vee Kids Fit helps students develop fitness knowledge while teaching them fun activities to improve their health and physical education. The students also enjoy a delicious and healthy meal, provided by Hy-Vee.